approach to building a high performing culture, and leveraging it as a competitive advantage. Best of all, it’s as simple as it is effective. In today’s commoditized world, your culture is the last remaining opportunity you have to create a sustainable competitive advantage. And while most leaders agree that culture is one of their most important priorities, few have any idea what to do about it. 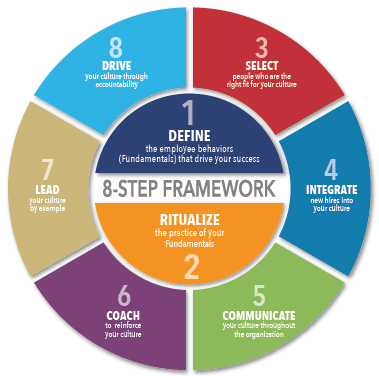 The foundation of HPC’s approach, known as the Fundamentals System™, is an 8-step framework that gives you the roadmap to truly “institutionalize” your culture. At the center of it all is a simple, but powerful idea: We help you to define your culture in terms of a set of specific, actionable, behaviors (we call them “Fundamentals”) that drive your success, and then we implement a set of weekly rituals to help you systematically teach and practice them over and over and over again. After all, nothing gets internalized without lots and lots of repetition. Sound like a simple, common sense approach? It is. And that’s why it works with remarkable consistency in companies of every size, in every imaginable industry. The Fundamentals System™ also includes an ever-evolving suite of products, tools, and training to help you deepen your practice over time and sustain your culture indefinitely. To view/download the PDF product sheets below, mouse-over each image and click. What does the Fundamentals System cost? High Performing Culture has developed a system that works in companies of virtually every size, industry, and type of workforce — professional, technical, industrial, blue and white color. It’s also surprisingly affordable. In fact, most of our more than 150 references will tell you that it’s the best investment they’ve ever made. Contact us today at 877-HPC-5050, ext 701 and you’ll have a cost proposal in your hands within 2 business days, after a brief call with one of our Senior Consultants.